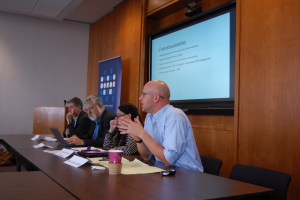 On October 20-22, 2016, AIPR and Columbia University’s Institute for the Study of Human Rights (ISHR) held an International Workshop on Historical Dialogues and Mass Atrocity Prevention with the support of the Swiss Federal Department of Foreign Affairs. The Workshop invited 21 academics and expert practitioners from around the world to present their work and participate in discussions oriented around the intersection of the two titular fields: historical dialogues and the prevention of mass atrocities. The event began with an official opening dinner, during which Dr. James Waller (Auschwitz Institute for Peace and Reconciliation/Keene State College), Dr. Constantin Goschler (Ruhr-Universität Bochum), and Dr. Elazar Barkan (Columbia University), the event’s organizing team, had an opportunity to introduce themselves and give a brief overview of the concept behind the workshop and their substantive goals for the event. Participants also had a chance to introduce themselves to the group and to speak briefly about their research efforts and objectives. 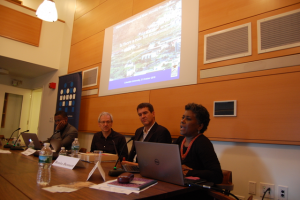 On Friday, October 21 and Saturday, October 22, the workshop’s panel presentations and group discussion sessions took place at Columbia University. Introductory remarks were made by AIPR’s Executive Director, Dr. Tibi Galis, who explained the mission and work of the Auschwitz Institute and by the ISHR’s Dr. Barkan, who discussed the intersection between the two fields and the merits of working to close the gaps between them and working collaboratively to create new avenues and resources for conflict resolution. 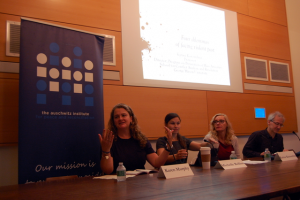 The event’s 7 thematic panels, which took place over the two days at Columbia, were dedicated to the topics of: textbooks and curricular reform, historical commissions, museums, national trauma in memory, the inclusion of historical dialogues in conflict resolution processes, the use of archives for the prevention of mass atrocities, and methods of embodying the past. With these themes as a guide, participants made presentations on a diverse range of subjects, from sharing experiences as a member of the trilateral German-Czech-Slovak Historical Commission to the role of museums as facilitators of historical dialogue and the character of visual art in post-conflict Guatemala. Members of AIPR’s staff were well represented among the participating experts. Dr. James Waller, Director of AIPR’s Academic Programs discussed his work on the social construction of identity trauma and its relationship to atrocity prevention efforts. Eugenia Carbone, Director of AIPR’s Latin American Program, examined the concept of national trauma as it relates to the period of Uruguay’s military dictatorship and its legacies, and Dr. Kerry Whigham, Fellow-in-Residence at AIPR’s Global Lemkin Seminar, examined the construction of public memorials in the U.S., Argentina, and Germany. The full event program can be viewed by clicking here. For more information on AIPR’s programming in the United States, please visit our U.S. Program page here.